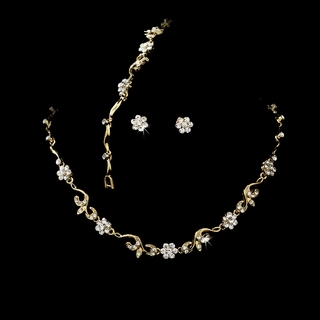 Clear rhinestone flowers and vines sparkle and shine in this stunning gold 3-piece set, which includes a necklace, earrings, and bracelet! This pretty set would be perfect for anything from a wedding or formal dance to a birthday or anniversary gift! Size: The necklace is adjustable from 13-1/2" to 16-1/2" long, the bracelet measures 6-1/2" long with a snap clasp, and the earrings measure 1/4" wide.